GearChanger assures that once you have established the correct market speed using GearBox, you can then choose the correct gear, or tick chart, to trade at ANY time during the day, so you’re always trading in harmony with the market. It’s not unlike the gear lever on your car which you use to select the correct gear, either to speed up or to slow down. More importantly, you must continue to change gears as road conditions vary and depending on whether you’re going uphill or downhill. This simple analogy reflects how market conditions are constantly shifting throughout the trading day. 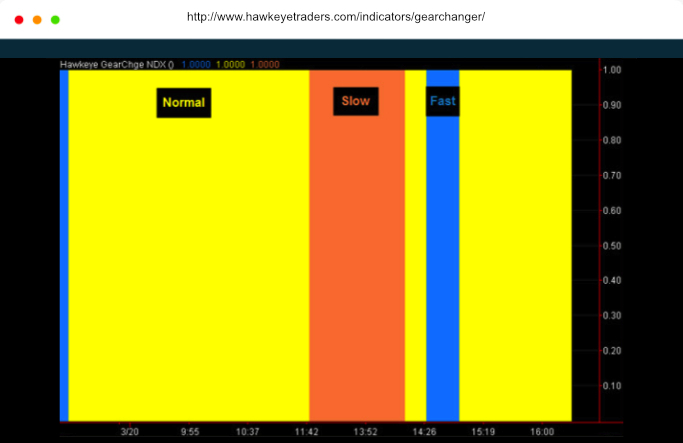 This is displayed graphically in GearChanger with light blue for the ultra fast tick chart, blue for the fast tick chart, yellow for the medium speed tick chart and red for the slowest tick chart. Remember, the speed of the market changes throughout the day, and in using the GearBox and GearChanger, you are always trading using the optimal tick speed setting for the day. In the example here, we can see that the GearChanger has told us to move from the fast tick chart to the medium speed tick chart, then to the slow tick chart, back to medium, and finally back to the fast tick chart again. It’s like having your own automatic gear selector – just sit back and enjoy the ride! With GearBox and GearChanger, you are trading in the best possible market environment for success with the lowest risk – on every single trade. The reason professional traders use tick charts is that they are PURE. They represent true market conditions, with PURE price action. This is the closest you can get to the heartbeat of the market. GearBox and GearChanger are unique indicators which put you directly in the driving seat. Let GearBox and GearChanger put you directly in the driving seat!